The movie is based on the book of the same name written by the late Swedish author Stieg Larsson. It's part of a trilogy of novels that has sold over 23 million copies worldwide. Everytime I walk into a Chapters or an Indigo, it's always on the bestsellers shelf/rack. So two weeks ago I sat at the bookstore for about an hour and started reading it. I got to around page 40 or so but the book never captivated me. It's just a straight up thriller/mystery story, what's the sell? I just don't get it. The Girl With the Dragon Tattoo is a Swedish produced thriller that follows an unlikely pairing of characters. The first is Mikael Blomkvist, a middle-aged journalist stuck in the middle of a controversy between his magazine company and a rich industrialist. He is hired by a rich old businessman named Henrik Vanger to solve a missing persons case, that of his beloved niece who has disappeared for 40 years. In exchange for his work, Vanger offers Blomkvist financial backing for the fledgling magazine company and evidence to prove his innocence amidst the controversy. 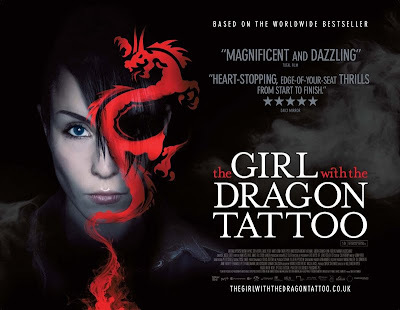 He is aided by Lisbeth Salander, a young bisexual, cyberpunk girl. Together they work to unravel the mystery behind Vanger's niece and the Vanger dynasty. In the end, the movie was alright, but certainly nothing to write home about. I enjoy thrillers as much as the next person but it just seemed to me that there was nothing that warranted all the acclaim that the book/movie was receiving. I think I had the same problem with this as I did with The Davinci Code movie. The stories are completely different but both are still highly acclaimed books. Yet with both movies, I just felt too much exposition; too much telling us what's happened instead of showing us what's happened. I think it works well in a book format as the whole adventure is created in our imaginations but I just don't think that style works with movies which are trying to show us the adventure. That said, the movie was beautifully shot and produced. I think I enjoy foreign movies because it is a complete escape, from locale to language to culture. This is only the second Swedish movie I've ever seen (with the first being Let the Right One In) and I'm still impressed with their quality of production. It's still in select theaters right now, so if you enjoyed the books, I suppose you couldn't go wrong with the movie. Otherwise, that's it for this week. Until next time, later geeks! Whoa. Weird coincidence here: I'm nearing the end of the book and got a little spooked, so I decided to put it down and hit the web. I thought the book started horribly slow and was quite tedious. In many respects it reminded me of a self-indulgent novel I wrote and abandoned about five years ago. The author of 'Tattoo' wrote these in his spare time for fun, and I think they would have been leaner and more captivating if he'd written w/ an audience in mind. So for 200 pages I was bored - I told someone it was like watching paste dry - but committed. Then slowly, slowly, slowly, I actually started to *care* about the mystery. I think it is largely due to the sheer weight of all the background you're given on the characters; you're forced to care by default. Now, 100 pages from the end I can admit to being legitimately spooked at the idea of heading to the dark basement to retrieve a load of laundry. Thanks for the input, I appreciate hearing from someone who's read/reading the book. So is the book or series worth the phenomenon that the media is making it out to be? Because the movie didn't make it seem that way, and since from what you say of a C-/D first half for the 1st half of the book, doesn't make it sound worthy of all the acclaim. 1st, apologies for my spelling in this comment. I'ts late. Honestly, while I wound up liking the book, all the hoopla and praise seems surreal. Stylistically it's clumbsy, the pace is slow, and (having now finished it) the book continues on for more than 50 pages AFTER the mystery is concluded! I disliked Da Vinci, but I could see why others would enjoy it. I'm not sure why this wasn't left on the shelves gathering dust.